Keeping the requirements of the customers in mind, we are engaged in manufacturing and supplying Industrial Silo. 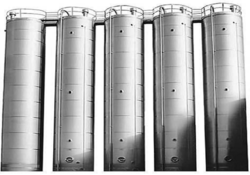 The range offered by us comprises Silo, Storage Tank and Bin Handling System. All these products are available in various specifications, so as to fulfill the needs of the patrons. While manufacturing these systems, our professionals utilize advanced machines and make sure to follow the industry set standards. Details of the product range are mentioned as follows. With an objective to fulfill the demands of the customers, we are engaged in manufacturing and supplying Grain Storage Silo. Extensively used in construction industry for receiving & storing cement and later conveying it through the screw conveyor for ready mix preparation. The silo offered by us complies with the established norms and standards of the industry and is available in various specifications to suit the diversified requirements of the customers.